Expanding the force/displacement eqn. (9.39) to include terms associated with the y- direction, requires the insertion of zeros in the stiffness matrix of eqn. (9.41) and hence becomes identical to eqn. (9.14). Again, by inserting zeros in the matrix, to accommodate terms associated with the y- direction, eqn. (9.42) becomes identical to eqn. (9.15). The element stiffness and stress matrices obtained above can be transformed from local to global coordinates using the procedures of § 9.7.1 to give the results previously obtained, namely the stiffness matrix of eqn. (9.23) and stress matrix of eqn. (9.26). Section 9.7.1 has covered the combination of individual element stiffness contributions, necessary to analyse an assemblage of elements representing a complete framework. Equilibrium and compatibility arguments were used to form the structural governing eqn. (9.28) and hence the assembled stiffness matrix, eqn. (9.29). Now, the alternative principle of virtual work will be used to derive the same equations. where [~p\ is the column matrix of all nodal virtual displacements for the structure and (fj is the column matrix of all nodal forces. Substituting from eqns. (9.43) and (9.44) into the equation of the principle of virtual work, eqn. (9.10) gives m .
which is the structural governing equation and the same as eqn. (9.28), and implies nodal force equilibrium. As with the previous treatment of the rod element, the two approaches using fundamental equations and the principle of virtual work will be employed to formulate the necessary equations for a simple beam element. Consider the case, similar to §9.7.1, in which the deformations, member stresses and reactions are required for planar frames, excepting that the member joints are now taken to be rigid and hence capable of transmitting moments. The behaviour of such frames can be represented as an assemblage of beam finite elements. 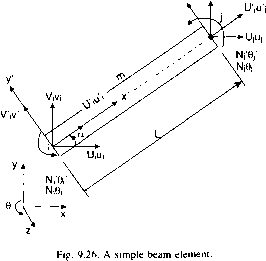 A typical simple beam element is shown in Fig. 9.26, the physical and material properties of which are taken to be constant throughout the element. 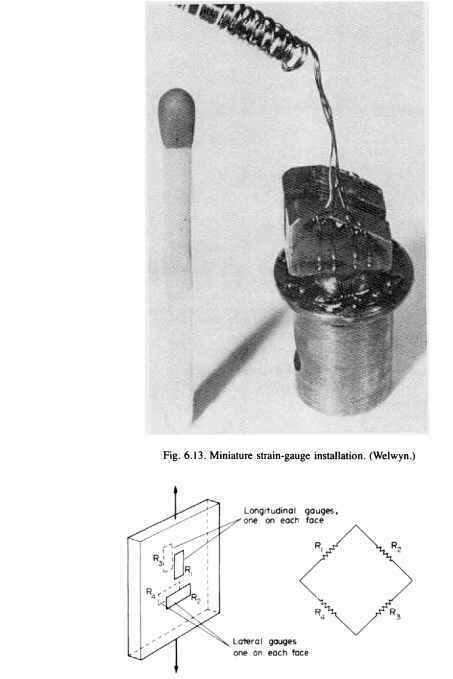 As with the previous rod element, changes in properties and load application are only admissible at nodal positions. In addition to u and v translatory freedoms, each node has a rotational freedom, 0, about the z axis, giving three dof. per node. Hence, axial, shear and flexural deformations will be represented, whilst torsional deformations which are inappropriate for planar frames will be ignored. Note that the shear force, eqn. (9.63) is independent of distance x' along the beam, i.e. constant, whilst the moment, eqn. (9.64) is linearly dependent on distance x', consistent with a beam subjected to concentrated forces.